Today is Pink Saturday's 2nd Birthday. Two years on the internet hosting a successful meme is not easy, and Pink Saturday seemed to have matured twice over in the same amount of time. My compliments to Beverly who have been very consistent every week, congratulations! With blogging a part of my life, I felt I have lived so much more! A reality where I can touch and physically be involved and another side of life on the internet that I can feel and absorb quietly. Both worlds running on high speeds at once. The reality is the kids are anxious about their summer vacation, it's time to figure out how we can build precious memories. Our neighbors are looking into the Disney World Packages and trying to figure out when they could go. I don't know about other people, but planning a Vacation package to Disney World or any place with children is most difficult. There are many things to think about, but then again Disney World is amazing, and the efforts will be worthwhile. For me, I am concentrating on exhaling after the last few months of chasing one big project after another. Slowing down gives me the opportunity to see beauties such as the pink ribbons below in the middle of no where. At Macro flowers, and Macro Monday you will see how everything is being appreciated through a magnified intensity. As you cannot appreciate the power of macro on this flowering pink ribbons bush, until you see how it looks without the macro power, Pic 2. 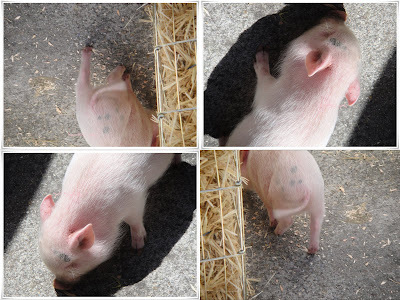 My next contribution is the Pink Oink Oink to Camera Critter and Shadow Shot Sunday. She is absolutely very cute in real life. A bit shy and was being bullied by a few of the chickens in the pen. But it didn't seemed to phase her, she shrugged it off and ran off to be on her own. She reminds me a lot of Trinity, not that she has been bullied but she is generally not a whiner or squealer. She wouldn't throw a fit, she would just move on. And because "pig" is Trinity's zodiac sign, I have grown to like the oink oink more now than ever before. I love how you incorporated many different things into one wonderful post. Gorgeous pictures, and have a fabulous weekend. Disneyland would be the perfect summertime escape. I hope it works out for you! What cute little oinkers....our friends just picked up their piggys last week. Had to laugh about the Disney trip above - don't go the third week in July - WAY to hot!! The workers were even telling us that that the last 2 weeks in July are the hottest @ Disney! What an adorable little pig - I want one!! Lovely shots! Apparently my sister was very fond of pigs when she was a little girl. Happy Critter Day and what a cute little *oink*!! Wonderful pink! The little piggie is adorable and casts terrific shadows! What a fun one for the day! Have a great weekend! I have never seen a "pink ribbons bush"...that is beautiful. You always make me smile when I read your posts; this time is the piggy being bulled by the chickens. I really appreciate your words about macros and thanks for this lovely contribution to Macro flowers Saturday! What a great shot for SSSunday your Oink is. Hope you had a wonderful Pink Saturday! That pink bush is sweet but I especially love the little piggy! So very cute! I want one for a pet :) Enjoy the rest of your weekend! Love those cute pink piggies!! Wonderful collection of photos! The pigs are so cute! Gorgeous flowers and I love the color. New photo challenges every weekday. I'm in love with the pink ribbon bush! Just gorgeous! Beautiful cake, and cute piggy..
All your pink shots are great but, I mus admit, the little piggy captured my heart! I think this is the first time I've ever seen a real living pig on PS, but she sure is adorable!!! Sorry for the late PS visit- so many pinks, so little time this long holiday weekend! Your pig is so nice and clean. We had a couple of pigs when we were growing up and they are really very nice animals. Take care & God bless ~ hope you enjoy that get away! Lovely color and pictures on the Pink ribbon bush. I cam e visit from Macro Monday, but I have fallen in love with the little piggy! How totally cute. Hurrah! Beautiful!!! It's funny that I missed my meme's 1st birthday, lol. So I'm aiming for that 100th post instead. Happy Pink Saturday, Amanda. We've been pinking together for a few months now. I am so glad you decided to participate, and thank you for everything you do to make Pink Saturday special. Thank you for the wonderful birthday wishes, and for the kind words. You always have an interesting perspective to share, and I agree that we can enrich our scope via the internet. I've learned something from each and every one of you.